After this integration with Paytm, Zomato will be able to add new users and expand its online food ordering business. At present, Zomato has over 80,000 restaurants across 120 cities . Paytm has a strong user-base in tier 2 and tier 3 cities, where users frequently use Zomato for a wide range of services offered online. Paytm is making stronger plans to build a solid presence in Tier-II and Tier-III cities and to get a strong foothold in online food delivery via its partnership with Zomato. E-commerce platform Paytm has partnered with online food delivery aggregator Zomato to help its users to order food through the mobile wallet application. The service has been made live in the Delhi-NCR region and will be phased out in different parts of the country soon. This follows the trend of aggregators from different markets entering the food delivery segment via partnership or in-house platforms. For example, home-grown cab hailing service Ola Cabs has joined hands with Swiggy to offer online food delivery right from its application. On the other hand, Uber flourished its own dedicated food delivery app Uber Eats around two years back. Paytm is planning to explore its strong presence in Tier-II and Tier-III cities to get a foothold in online food delivery via its partnership with Zomato. 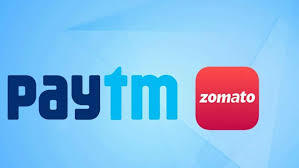 Paytm will bring this offering to its customers in these cities who do not use the Zomato application while exploring and tapping larger user base. The e-wallet platform will use the in-app food delivery option to push its use both online and offline presence in India. “Our association with Zomato is a valuable addition to our platform in bringing the convenience of ordering food online through our app. It is also an important step towards enhancing the overall offerings to our customers. We will continue to invest our efforts in this direction,” Paytm senior vice president Renu Satti said in an interview. Notably, Paytm’s parent company, One97 Communications and Zomato have a common investor in Alibaba. The payment platform is also backed by Softbank and Warren Buffet’s Berkshire Hathaway, along with others. The food delivery platform has Ant Financial, Sequoia Capital and Singapore sovereign fund Temasek. “We are excited to be partnering with them to integrate our online food delivery service with their mobile app. This will allow us to reach a much larger user base and add to the overall experience of ordering from Zomato,” Mohit Gupta, CEO, food delivery, Zomato, said in a statement.